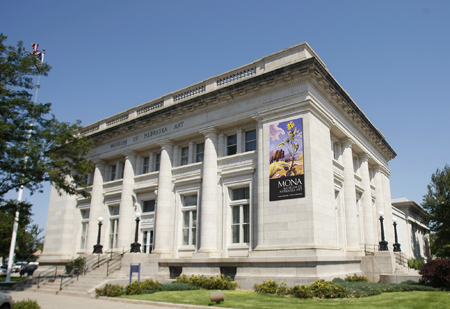 MONA’s ARTreach program provides exhibitions to various communities throughout Nebraska. The modest fee includes delivery to the exhibition venue, installation of the show, promotional and educational materials that supplement the exhibition’s theme, and return to MONA after the exhibition’s close. With professional assistance in managing the exhibition each step of the way, ARTreach exhibitions share MONA’s collection with a variety of venues across the state. Joel Sartore's Photo Ark: National Geographic photographer Joel Sartore started the Photo Ark, an archive of intimate and stunning photographic portraits of birds, fish, mammals, reptiles and amphibians, "to inspire people to care and help protect these animals." Women Artists from the MONA Collection presents a representative sample of the work of women who are integral to the development of art in Nebraska. Falter Illustrated reveals the creative process of Nebraska native John Falter who executed 129 cover illustrations for The Saturday Evening Post. Grant Reynard: Nebraska Regionalist focuses on the artist's view of his home state. While attending the McDowell Colony, Reynard met fellow Nebraskan Willa Cather, where she told him that when she wrote about what she knew most, she achieved her greatest success and encouraged him to do the same in his painting. Way To Go includes works depicting various modes of travel that were important to the development of the state. East to West: ANAC's Best presents a survey of award winning works accumulated over several years from the Association of Nebraska Art Clubs. Additional exhibitions are listed on the MONA website in the ARTreach section. Technical requirements: A secure environment where visitor activity is well-monitored is required, along with adequate wall space that is suitable for hanging works of art and sufficient artificial lighting for viewing of artworks. Exhibitions can be altered to suit exhibition spaces of varying sizes. Portable display panels are available to expand display space for 2-dimensional artwork. ARTreach shows have been exhibited in libraries, historical museums, art galleries, banks and opera houses. MONA has its own van for transporting shows to exhibition sites. Availability: No restrictions. Booking of specific exhibitions is subject to availability.